Luxury. Adventure. These are the two main words that the Omega Men’s 2220.80.00 Seamaster 300M Chrono Diver “James Bond” Watch brings to mind. Just because you love the great outdoors and live a very active outdoor lifestyle doesn’t mean you have to let go of luxury when it comes to watch choices. The great promise of ‘luxury outdoor’ watches is that they bring you a lot of style while not sacrificing on performance. Their very look brings to mind a ‘take charge’ active lifestyle that is at home both indoors and outdoors. Indeed, the three main factors to look for in luxury adventure watches bring these qualities to mind: style, movement type, and special features. When comparing different luxury outdoor/adventure type watches, you have to look for a fine balance between these three factors. You wouldn’t want a watch that looks so ‘outdoorsy’ that it would look out of place indoors. On the other hand, you wouldn’t want a watch that is so heavy on the luxury that it obviously looks too delicate for an active lifestyle. When it comes to delivering on the promise of the luxury adventure watch, the Omega Men’s 2220.80.00 Seamaster 300M Chrono Diver definitely makes a strong showing. After all, watch aficionados don’t call this watch the ‘James Bond’ watch for no reason. Within its elegant yet tough frame, this Omega watch seeks to establish a fine balance between style, performance, and durability. Overall, it is able to pull it off. After all, it does have a solid brand, Omega, backing it. Read below to get a detailed look at this watch’s strong points and areas for improvement. One of the biggest factors in considering luxury adventure or active luxury watches is that the model conveys the exact look of a watch you would want to use both indoors and outdoors. On this count, the Omega Men’s 2220.80.00 Seamaster 300M Chrono Diver “James Bond” Watch sends the right visual signals. It is very hard to confuse this watch with a pure luxury watch or overly rugged watch. It skillfully straddles that line between a luxury watch and a rugged watch you’d go camping, hiking, and fishing with. It clearly communicates that its wearer prizes an active lifestyle while retaining a strong sense of luxury. This watch runs automatically based on your body movement. The more you move, the more your motion will provide the energy for this watch’s internal mechanisms. 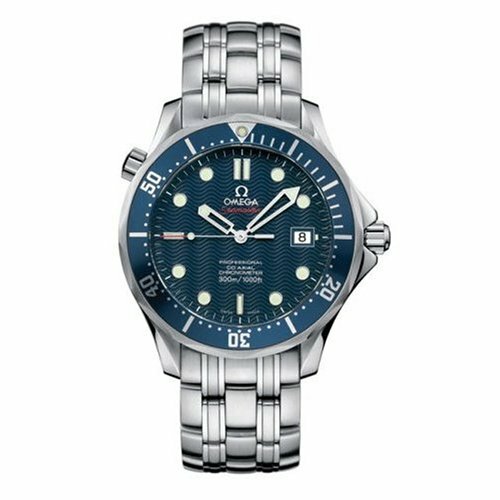 The Omega Men’s 2220.80.00 Seamaster 300M Chrono Diver “James Bond” Watch automatic movement establishes its luxury credentials clearly. After all, one of the key hallmarks of traditional luxury watches is an automatic movement system. When it comes to backing up its active lifestyle aspects, the Omega Men’s 2220.80.00 Seamaster 300M Chrono Diver “James Bond” Watch does more than a good job. It is superb. After all, it wouldn’t be much of a James Bond watch if it was only water resistant at very shallow depths. Plus, its dome design clearly shows that it is serious when it comes to outdoor action. When it comes to luxury watches with active outdoor lifestyle elements, watch models really have to straddle a thin line. It is too easy to fall into the luxury or outdoor side. Not only does the Omega Men’s 2220.80.00 Seamaster 300M Chrono Diver “James Bond” Watch effectively straddle this design tightrope it manages to do so by truly delivering on the key criteria users have for watches of its class. Well played!